Mario Carreño pursued his education at the Escuela Nacional de Bellas Artes San Alejandro (Havana, 1925-1926), the Escuela Superior de Bellas Artes de la Real Academia de San Fernando (Madrid, 1932-1935), l’ École des Arts Appliqués and the Académie Julian (both in Paris, 1937-1939). In Havana and in Madrid, he made a living as an illustrator and interior designer. His circle of friends included poets Pablo Neruda, Federico García Lorca, and Rafael Alberti. Mario Carreño’s early paintings were figurative, alternating between the subjects taken from nature and social life. His leftist political militancy frequently caused him problems with the Spanish authorities. In 1935, he returned to Cuba, where he exhibited his work and produced murals, and the following year he traveled to Mexico, where he came into contact with the Mexican muralists. During a brief stay in Havana, he was awarded the Premio Nacional de Pintura and then returned to Europe. At the onset of World War II, he fled to America and, after a short stop in New York, returned to Cuba in 1941. During the following two decades, Carreño traveled between Havana and New York, where he taught at the New School for Social Research. At the beginning of the 1940s, his painting followed the Renaissance’s classic pattern, focusing on social and traditional themes, but with a distinctly dramatic touch. In the second half of the decade, his work became more modernized with less voluminous forms as he assimilated the influence of the European avante-garde. Between 1948 and 1949, he traveled to Chile and exhibited in Chile and Argentina. In the 1950s Carreño’s interest in abstract painting increased. In 1952, he founded, with Sandú Darié and Luis Martinez Pedro, the magazine Noticias de arte, which reported the latest news on abstract-geometric art. In the middle of the decade, Carreño received the Premio Nacional de Pintura award at the Salon Oficial de La Habana (1954) and the Guggenheim International Award (1956). In 1958, he moved to Santiago de Chile to work as an educator. He founded, with other artists and architects, the Escuela de Artes de la Universidad Catolica and joined the Grupo Rectángulo, which, beginning in 1955, promoted the practice of geometric abstraction. 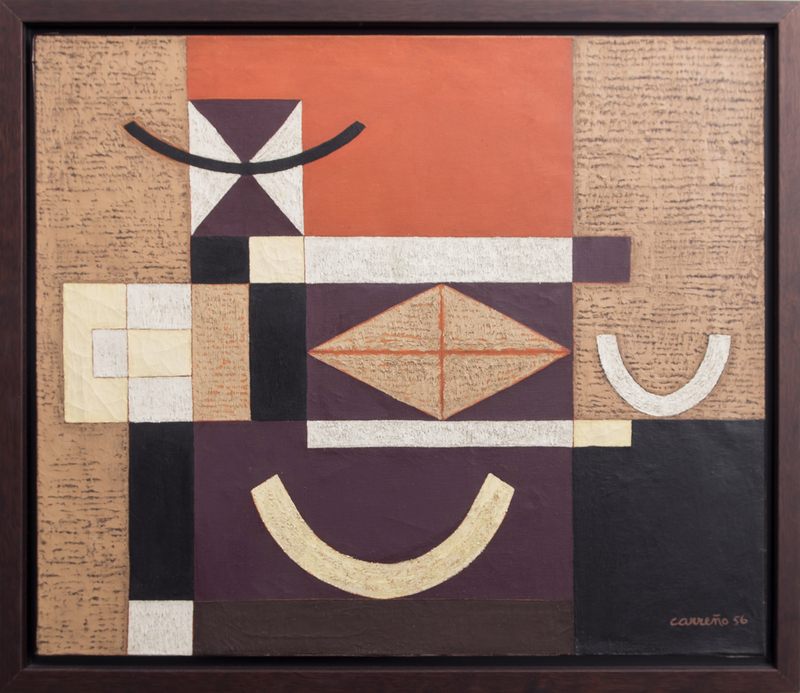 In his last years in Cuba and his first years in Chile Carreño’s abstract work was characterized by rigororous formal solidity while retaining the forms and precise outlines and voluptuous and exuberant color from his previous work. After a trip to Europe in 1962 and 1963, during which he visited Paris, Amsterdam and Brussels, Carreño returned to Chile. He was highly concerned by the climate of the Cold War and the threat of a new world-war conflict, and he decided that abstraction could not express the anguish of the prospect of imminent catastrophe. He returned to figurative art influcenced by the theories of surrealism. Human ruin and the world’s fragmentation were, from then on, the dominant subjects of his apocalyptic images. In 1969, Carreño became a Chilean citizen. The coup d’état that ended the government of Salvador Allende, the death and the disappearance of several of his friends, and his own conflicts with the regime restored by Augusto Pinochet, made it difficult for him to continue working. In 1982, Carreño received the Premio Nacional de Arte and the Medalla de Oro of the Universidad Catolica de Chile. From 1985 onward, health problems progressively limited his artistic activity. In 1993, he visited Cuba for the last time, and the following year he stopped painting altogether. Grupo Rectángulo- Group founded in Santiago in 1955. Its members (Gustavo Poblete, Ramón Vergara Grez, Matilde Pérez, Elsa Bolívar, Ximena Cristi, Meruja Pinedo and Uwe Grumann) were some of the first exponents of geometric abstraction in Chile. They gave relevance to theoretical reflections about their artistic practices. They got the support of Cuban artist Mario Carreño after he settled in Chile in 1958.